We’re in the midst of Apple Season, the longest season of any fruit that exists. It stretches from late summer to late winter, and is rivaled in duration perhaps only by Potato Season, but potatoes aren’t even a fruit. So…back to apples. Don’t get mad at apples! Just make this tart!! Meanwhile, spread sugar in a medium skillet and cook over medium heat, stirring occasionally from the outside edge toward the center, until sugar melts, about 3 minutes. Continue to cook, swirling pan occasionally, until syrup turns deep amber in color, about 3 minutes more. Carefully add apples to pan and spread in a single layer. Remove pan from heat and let sit until apples release some juices, absorb the caramel, and cool, about 30 minutes. Some sugar will crystallize, don’t worry, it’s supposed to! Core apples and slice crosswise into rings (do not peel them unless you absolutely insist). Transfer to a medium bowl. Add lemon juice, sugar, and salt and toss to coat. Arrange apples into chilled crust in rough concentric circles without making a big mound in the center (they should come up about ½” over top of pan; snack on any extra pieces left in the bowl). Brush or drizzle brown butter over apples (use all of it). 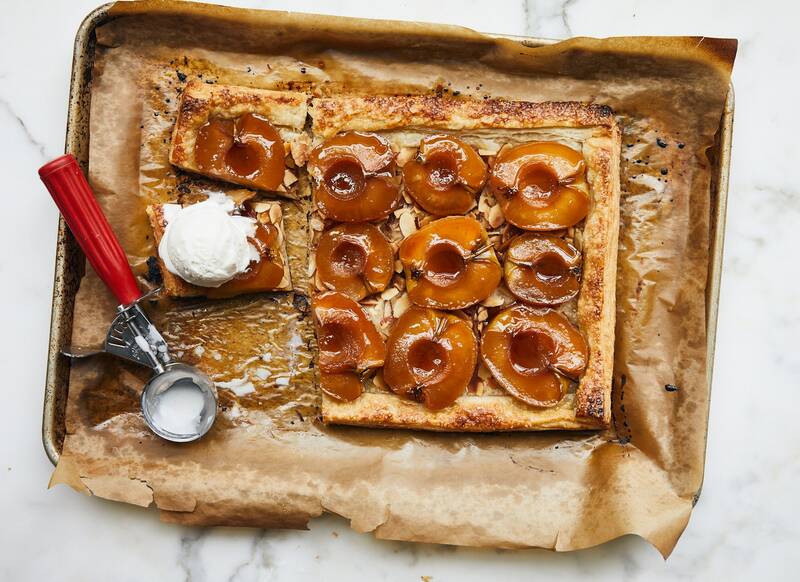 Place tart on a rimmed baking sheet and bake, rotating pan halfway through, until crust is deep golden brown and apples on surface are softened and starting to take on a little color at edges, 55–65 minutes. Do not underbake. Let tart cool on baking sheet until warm, then remove ring and cut into wedges.